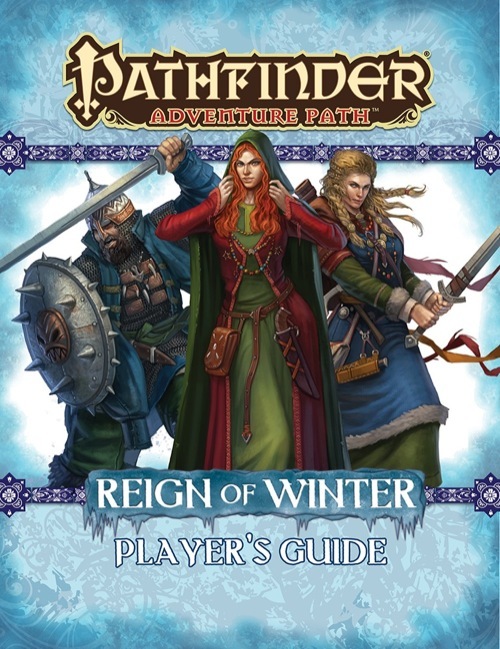 The Reign of Winter Player’s Guide gives players all the spoiler-free information, inspiration, and new rules they’ll need to create characters prepared for delving into the adventure and frigid mysteries of the Reign of Winter Adventure Path. 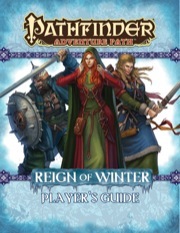 Within, players of this campaign will find everything they need to create character backgrounds tied to personalities and events vital to Pathfinder Adventure Path’s fight to turn back the tide of unseasonable pockets of winter popping up all over Golarion. Inside players find campaign-specific traits to give adventurers the edge they need to take on cruel witches, evil fey, and frigid threats encountered amid the snow and ice. This player’s guide also features a brief survey of Heldren, a small village in southern Taldor where the excitement begins, as well as various class options for heroes ready to take up the call to end the Reign of Winter! Adventurers don't need to head out into the cold unprepared! Gather your allies and let the Reign of Winter Player's Guide start your trip into the thrill and danger of the Reign of Winter Adventure Path. Reign of Winter is a very linear adventure path. One event leads into the next in a somewhat preordained manner, and given its constant movement from one location to the next, there’s not a lot of opportunity for the PCs to stop and do their own thing. There’s certainly no opportunity for side quests. For this reason, characters need to be well-suited for what’s ahead, and their backgrounds need to reflect their abilities (although there are otherwise very few restrictions on appropriate character backgrounds and origins). The Reign of Winter Player’s Guide helps players create such useful characters, and it accomplishes this quite admirably. I've posted a review on RPGGeek.com. It's strange, but I kind of see the release of the Player's Guide as the opening overture for each AP. It's the announcement: Now we begin! Ok everybody...say it with me...all together now...YAY!!!!! the hell of eternal waiting has finally frozen over! Very classy move putting the Winter Witch Archetype and the Winter Witch Prestige Class in the Player's Guide. Well done! Yep. Saves people trying to remember wich two or three products they were tucked away in :p.
I'm a bit annoyed by the campaign traits, considering they are the same as those presented in People of the North. They're supposed to be, just like the Shattered Star campaign traits were in Varisia: Birthplace of Legends. The two-page spread in People of the North is specifically headed "Reign of Winter Player's Guide." Let's remember not to post spoilers from the other Reign Of Winter threads or product descriptions! Given the flurry of discussion, a lot of us have kind of taken details of this AP for granted, but we should try to keep the player's guide thread spoiler free! Not-Quite-As-Big-As-Medium-Jock-But-Not-Quite-As-Wee-As-Wee-Jock Jock: Gnome Arctic Druid. Mmmm... toasted gnome... my favorite! Endure Elements as a permanent effect from level 3 and extra resistant to both cold damage and non-lethal damage. I've been looking forward to this Player's Guide, but after reading it I'm not exactly sure how I feel about it. Compared to all the other Player's Guides we have from the former AP's, this one doesn't fool around with nice but somewhat vague descriptions - which is refreshing. However, I have to wonder how many GM's complained about spoilers to Paizo for the first paragraph to happen? I can't recall any former Guides to be that much of a spoiler to any major point of the respective AP... also, giving the players options necessitates some information what these options are about/for, no? Just because the AP is titled "Reign of Winter" and the name Baba Yaga is thrown around doesn't give the whole plot away, at least not any more than "Rise of the Runelords" told you that some ancient dudes were about to come back, or how "Kingmaker" indictated that you wouldn't be a dingy commoner forever. Maybe its just me. I am a little sad to see that there isn't any race and class advice. I can see that stuff about races is difficult to pull off when the guide tells you outright you will go to a a lot of exotic places, but not even classes? This was always cool for new players or if someone was totally lost about what to play (and it didn't stop the Jade Regent PG to include such information). The Cold Weather Primer is cool (pun intended), I'm sure it replaces what might have been a new mechanic or subsystem in other Player's Guides. Nice to see that some of the lesser-used Core Rules are being put to use. Bonus points for inclusion of Winter Witch archetype and PrC, and cold weather equipment. Hooray! Glad its out, can't wait to play this one. Regarding the no-spoiler section, I think it was unnecessary. The player's guides never gave anything away that the players SHOULD'T know, and neither does this one. Even very detailed guides, like Carrion Crown and Jade Regent, helped give an idea of what was coming without spoiling anything secret. I'd have rather seen that space filled with information Heldren, what the PC's likely know at the beginning of the adventure, or cold weather survival tips. I miss the guides that gave information specific to races and classes, those had the best value in my opinion. I'm not going to complain about a free product, especially when they're as good as this, but that format always appealed to me the most. Huh, just noticed that the Winter Witch prestige class in this PDF differs from both the original winter witch in Paths of Prestige, as well as the web supplement they released intended to fix the winter witch. Any reason why?